How to make a website on WordPress in 2019. Let’s build a website together in 32 simple steps. Click the link above and we’ll start from the same Bluehost signup page together, because I’m making a real website today, right along with you. No confusion means you save a lot of time. The real value here is the time you’ll save by following along with me literally click-by-click. Does your business website need an upgrade. Or, do you want to get started earning online? You no longer need to spend thousands to get a beautiful, functional website you can edit yourself, even if you have no tech knowledge at all. The process of making a website has changed. Today we have drag-and drop-page builders and other tools that are visually intuitive, and I’ll show you exactly how to get the most out of them. No coding, no confusion. Even the WordPress installation is basically automatic. In fact, if you can work a mouse and you have an email address, you’ll make it through this step-by-step tutorial with no problems. 5) easy to add content to–I’ll show you how can do it yourself. Add text, titles, images and even video like a pro. Using my link to purchase hosting earns me a commission–thank you–but there’s no extra cost to you. In fact as I say you can be sure you’re getting the best current Bluehost price plus all the other benefits, and it encourages me to keep making videos like this. I’m moving pretty fast. It’s by design, to cover more topics. Please use the pause button on the video. As you sign up for Bluehost you can click back and forth from this tutorial to the browser tab or window(s) in which you first sign up, and then keep building your new site as you follow me. I have an old MacBook Pro, a mid-2010 model running Sierra OS X, or macOS Sierra as it’s now apparently known. Naturally an 8-year-old laptop has been slowing down, giving me small problems for years. A few days ago I arrived at the place I knew we were going, and no finally arguing with it: my MacBook Pro won’t turn on…. It was stuck at the screen with the Apple logo and the progress bar or loading bar right beneath it. Soft resets, hard resets, no matter what I tried the progress bar would stop about halfway through, maybe two thirds of the way. It had been booting up slowly for years—five or ten minutes to start–and it was getting worse, as these things do. Naturally this happened when I was getting my main computer fixed, and long story short I needed a computer to get things done asap. This is the story of what I did to fix my old MacBook Pro (I write this in mid-2018), but before I get going, fair warning: this might not be a solution for you. You’ll see what I mean below. Because nothing I read as I searched for a solution for the progress bar stopping recommended this as a fix in my situation. But I will say this: I’m happy I used the following solution. Now I had a hard time even getting to macOS Utilities window. I kept on trying, feeling like a dummy. Most times the progress bar just stopped, but I noticed it stopped at slightly different points several times. But each time, when I booted up again, I was looking again at the same stuck progress bar. On my phone I looked for clues in the Apple Support forums naturally. Some people said they’d fixed the problem by doing what I’d done. You wonder what the other Mac users ended up doing. Next step: reinstall OS X? It is possible to reinstall OS X/macOS—it’s called an install in place–without losing your data, apps, etc. I tried this, it took an hour or so, just long enough for me to build up some hope that his would work and let me avoid more expensive solutions in terms of both money and time. I’m living in Bali, Indonesia, where there aren’t yet any official Apple Stores, though there are a shops with Apple logos on them and people who will encourage you to bring your computer to them for a look. Most of these techs mean well I think, but still I avoid this situation. When the fresh operating system install in place was done I rebooted and….yeah. Same result as before. By now I had hours into this and began to feel tempted by a last ditch solution. Yep, I’m talking about wiping the hard drive—I mean delete the data and the operating system, and eight years of lord-knows-what-stuff might have compromised the drive–assuming of course that the problem was something other than old hardware. I was getting the sinking feeling that it was in fact the age of the hard drive or something else hardware-related, and in a way that gave me a ‘nothing to lose’ feeling. Let’s back up though: why was completely wiping the hard drive such a big deal for me? So here’s where I admit to one of my many character defects. I had no Time Machine backup. In fact, no backup of this hard drive at all. So, mea culpa. All my fault. If you’re reading this and you do have a backup, you will probably want to try going back to a point to where things were working, restore from that point and see if that fixes your problem (disclaimer: I’m not a hardware tech nor a genius of any kind, Mac or otherwise). Here’s the part of my solution you might find controversial, or even a 100% no-go. Again, if you live near an Apple Store you’ll want to go see them for advice at this point–I would have, but again it wasn’t an option for me. So I decided to try this fresh reinstall of OS X that also would wipe the entire hard drive, deleting several years of data and putting the computer back at its original state. In some ways this wasn’t a huge deal for me. Most of what I really care about (personal images, video, docs, etc) are backed up in the Cloud somewhere, places like iCloud, Google Drive, Dropbox, Lastpass, etc. I knew I’d even have my browser bookmarks. Most importantly for what I use and refer to on a daily basis: I’d have everything in my Evernote. It might sound strange but as I ran thru things that I really didn’t want to lose, I thought of almost nothing that I wasn’t sure was already in my Evernote, or in the case of media files iCloud. Still, I knew I’d be losing some data that I might have wanted to keep. But with no way (of which I was aware) to reboot one last time to make a backup, and no technician to help me, I was stuck. Also, my understanding is that there are 3rd party solutions that let you recover your data from a wiped hard drive, i.e. that it isn’t actually gone until you over rite it with new data, post-wipe. 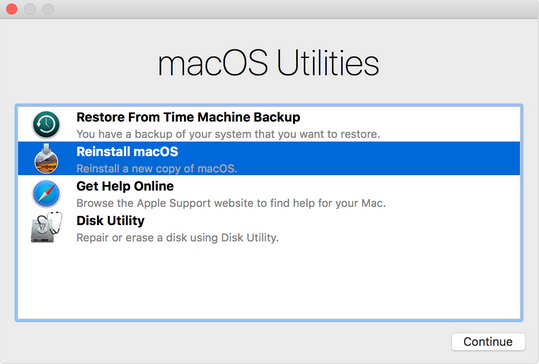 So before I tell you how this went for me I’ll reiterate: if you’re on a Mac you have a really easy backup solution, right now, while things still work: Time Machine. As soon as you’re done with this article make a backup. In fact go do it now! Set up scheduled backups. That way if you wake up one morning and find your MacBook Pro won’t turn on you’ll have the best of both worlds: a fresh machine with just the data you really don’t want to lose or go looking for elsewhere in the Cloud, and apps you won’t have to take the time to reinstall. So I went into Disk Utility and erased my disk. It’s a little chilling how little time that operation takes! Then for the second time that day I reinstalled OS X. An hour or so later I heard the chime and came back to the MacBook Pro and well, it worked. The progress bar moved quickly from left to right! Of course I had to do the whole setup routine again, but it was relatively painless. I reinstalled a few apps, knowing that I’d need more as I go. So how does my Macbook Pro perform now? I’ve gone from a several minute boot-up time to less than a minute. The machine is definitely faster now. The slow performance I’d been putting up with, figuring the problem was my eight-year old hardware, clearly has been something other than a hardware problem. This was a revelation for me. And it might be for you too. I though I had an old computer that was on its last legs. Of course this MacBook Pro could die tomorrow, but clearly it is still better hardware than I assumed. I would not have ever know this unless I did the total wipe as a last-ditch effort. So here is where I’ll get a little controversial. Do you have a Macbook Pro that Won’t Turn On? Have you exhausted your other options, or have they given you an estimate down at the Apple Store that is more than you can handle right now? Especially if you have a recent backup, after trying everything else you might consider wiping your hard disk completely, and reinstalling OS X/macOS.But even if you don’t…if you are prepared to lose some data that isn’t in the cloud or on another drive, it might be a fair tradeoff. My experience showed that you might have a machine that is actually in FAR better shape than you think. Post-disk wipe it will probably waste much less of your time, in terms of booting up and also how often you see the spinning rainbow ball. I haven’t seen it once yet… Honestly my laptop feels new in many ways. I can say one thing definitively: even without a backup I’m glad I went the route I did. What do you do when you get a couple dozen breathless emails from people planning a vacation to the place you live, folks who need to make a decision fast as to whether they should cancel their vacation or not, because there’s a volcano that’s about to erupt there…..? Well, what I did was my first Facebook Live video experiment. It was just me talking for several minutes about the impending volcanic eruption here in the island of Bali, Indonesia where I’ve had a place since 2005. Not hard for me to do. Is it OK for you to come to Bali right now? I've had a lot of inquiries from Wagefreedom.com readers so here's a fast update on the Bali Mt. Agung volcano situation. In a few hours I’ll send it out to several thousand subscribers on my email list for that site. Lately I’ve been writing here on Digital Media Minute about how Facebook and YouTube see much more engagement with live video, so their algorithms now favor it. I’ll translate that for those of you who aren’t marketing geeks like me. It means free exposure. The thing is that live video done right can have both extremely low costs and be very effective. You could deliver whatever you’re doing in the form of tutorials, AMAs (Ask Me Anything), revies of products, interviews, etc. As a viewer I know I’d be more forgiving of small production slipups, too many “ums” and a shaking camera (the last two of which you’ll see above! ), if it was delivered live. It just seems more interesting because you feel like anything can happen. A person told me after he saw this live video session that he was just mesmerized by the fact that I was speaking live from the other side of the world about what was happening this morning in Bali. There’s an immediacy with live video that you aren’t getting with the wall-to-wall non-live video Facebook is showing you in your News Feed n0wadays. At any rate, I’m seeing both Youtube Live and Facebook Live video a lot more from marketers I respect, just in the last few months. So why can’t I do the same? And, for that matter, why can’t you? What’s your expertise? I can leverage a tropical island and I can talk about expat-ism, digital nomads and generally using the Internet to make money till the cows come home. A lot of people in the world aren’t too interested in those topics, but enough are for me to talk to them. So tactic number one for me will to see if I can swing my subscriber list around to follow me on Facebook, and then see if I can get them to show up when I have something to talk about. I think the plan for now is to go in with one narrow-ish topic that I can cover in two or three minutes, and just do so as well as I can and then sign off. Don’t waste anyone’s time and don’t bore them. Of course if someone has questions I could segue into other answers or topics. What I don’t want to do is the be one of these guys who, well, just talk. I wouldn’t disparage anyone’s business model but I the other night I saw basically the direction I don’t want to go: a guy with purple hair was walking around San Francisco looking for a place to eat. Several hundred people were watching his YouTube Live broadcast. Finally, he ordered onion rings. That was the point of the video….. More power to him. And making money with live video? My attitude is that if you have the audience there is always a way to make money from it. Especially if your intentions are good and ypu really do ‘provide value’, even if that value is entertainment. Either entertain or help. Or both. Lord knows I’m not very entertaining but I’ve helped a lot of people make money online and also make the transition to becoming an expat. It’s a start. Now I just need an Airselfie. So I’m sitting within 50 miles (~80 kilometers) of Mount Agung, a volcano that’s about to erupt, probably, on the island of Bali, Indonesia in the Indian Ocean. How’s your day going? They’ve evacuated thousands of people living within a radius of roughly 6 miles (10 km) of Mt. Agung to shelters elsewhere in Bali. Most of the people living in the area are farmers, just getting by. They’re already experiencing a lot of anguish over having to leave their animals behind, and some apparently refuse to go. It’s sad. Other volcanoes in Java and Sumatra have erupted in recent years and these eruptions sometimes displace people for many weeks. It’s impossible to know what’s going to happen here. The last time Mt. Agung erupted was 1963. Over 1000 people were killed by that eruption, but in theory our monitoring today is good enough that we should be able to give everyone at least a chance to leave. 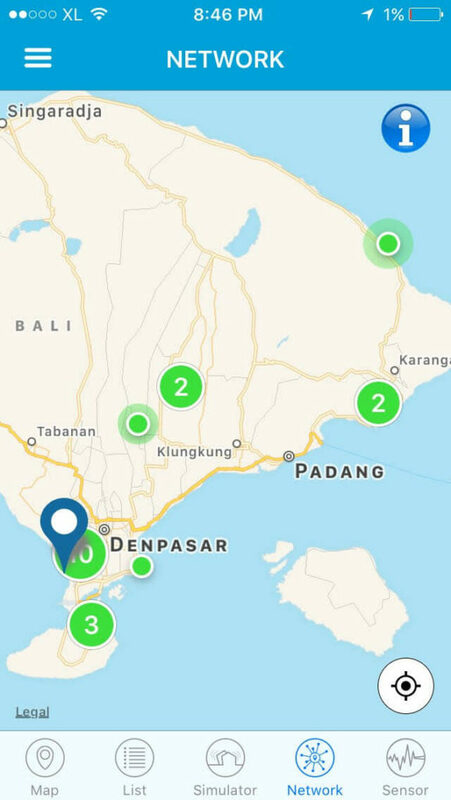 Today I was pointed to an amazing free app for iOS that could make people a little safer if the earth starts shaking, as happens during volcanic eruptions, and as is already happening in much of Bali. …uses a network of seismic sensors to detect earthquakes. When an earthquake occurs, the Zizmos servers send the user an early-warning notification that alerts the user of expected shaking in the area. The ability to detect earthquakes and provide alerts is dependent on the number of sensors in the Zizmos network. Another feature of eQuake® is its capability to use your phone as a sensor which contributes to the Zizmos earthquake warning system improving the coverage of seismic detection. The sensor mode only works when the device is charging and connected to a Wi-Fi network. The early warning notifications come in the form of an audio human voice countdown of the seconds until the ground at your location will start shaking. Assuming it works as advertised, this is huge. I know from plenty of experience in California and Indonesia how hard it can be to get outside as fast as you’d like during an earthquake. Velocity tends to increase with depth and ranges from approximately 2 to 8 km/s in the Earth’s crust, up to 13 km/s in the deep mantle. Living as we do here in Bali on the 3rd floor of a 5-story building, even 10 or 15 seconds could be the difference between whether we can get to the ground floor before a possible building collapse, or not. For a shallow earthquake say 80 kms away, 10 to 40 seconds warning is a lot better than being woken up by shaking, as we have been many times. For people who live in earthquake-prone parts of the world, I see no downside in installing the free eQuake app. 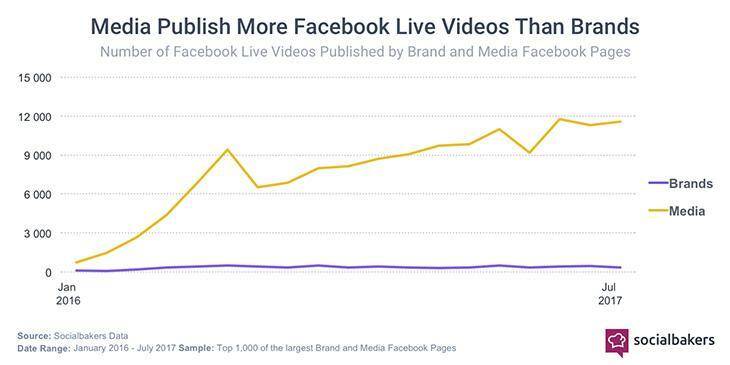 Way back in March of 2016 Facebook announced that its algorithm would be favoring live video content even more than it does regular native video in News Feed. Remember that Facebook didn’t arbitrarily decide to do this: naturally it’s a response to user consumption patterns. When a company tells you not only what’s working best for engaging users on its platform, but that they’re basically changing the rules to favor content produced in a given format, you’d think that companies would sit up, take notice and aggressively move into producing content in that format, at least to test. But in this case, at least so far, you’d be wrong. Take a look at this chart from socialbakers. What do you see? I see a huge, gaping opportunity for brands, or companies of any size. People like it. Facebook users are more likely to (consume/engage) with live video content. Facebook really hopes you’ll use it. All else being equal, Facebook will give you an advantage in the News Feed over other types of content the competition is creating. Potentially low production costs. By applying some creativity, cost-conscious companies and brands can keep the expense of leveraging live video relatively low. Post-production costs are not a factor with live video, and you’ll probably be forgiven for not having slick production with Facebook Live. It’s easy to imagine approaches that make use of spontaneity, personality and raw information over elaborate sets, etc. All this adds up to real opportunity for disruption vs companies with larger budgets. Competitive advantage. Your competition in your niche is probably having a hard time making Facebook Live work for them, or more likely, aren’t even trying! A chance to leverage organic reach again. This is not paid advertising. The costs of this exposure is limited to production costs which again, can be kept low. Even testing paid Facebook ads can get expensive. One good idea well-executed with Facebook Live could achieve or exceed the kind of reach we’d love to achieve with paid ads. If you’re handling marketing for a company of any size, you should be testing ways to reach prospects and customers with Facebook Live. For marketing agencies the opportunity is profound. Look again at the chart above. In 18 months the adoption of Facebook Live by brands is virtually negligible. An agency that can find a way to help its clients systematically make effective use of Facebook Live would be filling a huge need from which it could really expand its client base. I received an email from a Digital Media Minute reader in response to a recent post on Internet marketing newsletters I recommend subscribing to, where I listed nine newsletters that have helped me a lot over the years. The reader complained that I’d pointed to these examples of great newsletters without really explaining how email marketing works and why it’s effective, also saying that he thought people were getting more than enough email as it is. 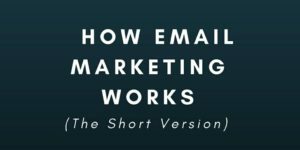 I thought I’d take a minute to quickly go over the thought process behind email marketing, just the basics and why it makes sense for both marketers and their subscribers. Give as much value as you can to the subscribers on your email list. That doesn’t mean give value only after your readers have subscribed. It really starts with the content marketing you’re doing on your website, publishing content Google deems worthy enough to send people to. Content that gets readers’ attention and eventually has them recognizing you as an authority. This helps you as a marketer in your efforts to get readers to trade their email address for a ‘lead magnet’ from you. A lead magnet is a piece of quality content that will teach something related to the reason your readers came to your site in the first place. An ‘ethical bribe’, it could be a pdf or an infographic, free entrance to a webinar, or even a short course on a topic, delivered by–you guessed it–email. With both your website articles/blog posts and your lead magnet, your goal is to educate and delight with the quality of the content you provide. It’s critical that your new subscribers associate your content with being valuable. It will have them paying attention and opening those critical first emails you send them. The first newsletters you send should create a small habit in them to look forward to what you send for the value it contains. It will also help to keep your emails out of their spam folder. After this, you send out regular emails, always providing value. What about making money? Some marketers sell every once in a while to their subscribers, some sell on every single email (as we all know). This is critical: do surveys and track email clicks to understand the people on your list, segment them based on those interests, and market to them accordingly. This little dance to grow and sell to your list is still**very**effective in 2017, especially when done with care. If you have a website, no matter if you are business or a blogger, even if you don’t yet know what you’ll sell your list, you should be making one. Sumo.com has excellent free tools to help you get started. Even as a blogger with no thoughts yet of monetizing your efforts, your subscribers might become customers for digital products you create, or prospective clients for a marketing agency you might start. No matter what you’re doing, there’s no reason not to attempt a communications channel for the 95+% of people who come to your site and never come back. They say ‘the money is in the list’, and it’s one of those adages that’s still hard to argue with. For many people, collecting email addresses begins their transition from ‘blogger’ to online marketer. It’s easy to find people selling online courses on SEO, paid traffic, copywriting, and many other skills that marketers in 2017 should have. No doubt some of them will accelerate your education. There is also a lot of free, high-quality info out there. You’ll find it via Google as part of the content marketing ‘value’ that marketing experts looking to eventually sell those courses on email marketing skills will provide. If money’s tight and you’re motivated you can absolutely get started without paying for a course. There’s one problem: a lot Internet marketing info online is either inaccurate of outdated. The tools and methods change constantly. Also, it can be hard to know if someone you’ve never heard of before has actual experience or just a bunch of theories. Internet marketing newsletters are a great way to get some of the best content from professionals you’ve decided are competent, most likely after reading their blog content. Often marketers feel obliged to deliver some of their best free content to their newsletter subscribers. Over the years I’ve been blown away at the quality of the best of it–articles introducing me to concepts and methods I’ve used to make money. Today I’ll point you to several marketers whose free content–blog posts/lead magnets/emails–have helped me become a better marketer. But the newsletters these experts send all include an additional helpful little built-in hack. I suggest subscribing to all the newsletters below not just for the quality info each provides in their area of expertise, but because each of them, if you pay attention, also gives you a lesson on how to how to communicate with your subscribers, from the initial content marketing thru to product launches. After all, marketing with email newsletters is itself an important skill to have in 2017 and will be for a while. Some of these folks have businesses doing seven-figures per year of revenue. Their newsletters, for all of them, are a big part of their success. Who better to learn email marketing from? Not theory, and not a course. The actual processes that work for each of them. You can be sure the emails you’re getting from them have been tested and refined for conversions. See how valuable this is? So here’s what I’m suggesting: get as much as you can out of the free material these experts share with you in lead magnets, emails and even free courses. But look at the email sequences they send too. As I say, I’ve done this myself–reading one email after the other to get the flow and the big picture. It’s helped me. So on to the list, in no particular order. If you’re worried about getting flooded with emails, set up a new account just for your Internet marketing education. And by the way, if you’re just getting started and wondering how to ‘get on a list’, just look for the enticing free offer somewhere on the person’s homepage, or in a pop-up– that’s the lead magnet. Sometimes there are a few of them! Pat’s been around for almost 10 years and has helped so many people. There’s gold in the archives of all the marketers on this list but no one more than Pat. It looks like nowadays from his homepage you can choose which of the following topics you want to learn, and enter a unique email funnel for that topic. You’ll be offered a ton of free education and lead magnets appropriate to the topic. See how Internet marketing newsletters work? Bryan focuses nowadays on helping you build your list–and fast–but you should also look through the articles in his site archives. Brian has a creative, original approach–spend time on his site looking though a huge amount of free value, like his business formulas to get an idea of what I mean, but definitely sign up for his list! Affiliate marketing using paid traffic–Facebook ads, Google Adwords, mobile ad inventory, etc.–to earn commission on products you don’t own, is a complex challenge with a lot of moving parts. To do well at it requires competence in several different skills. This form of Internet marketing is also a way to make a whole lot of money quickly if you can find or create an edge. Charles Ngo has been one of the top affiliate marketers in the world for almost 10 years now. To determine whether this business is for you, or to start to really understand it if you think it is, I can’t think of a better person to learn from than Charles. Affiliate marketing is notorious for fake gurus out to exploit people full of hope who know how lucrative the business can be. Charles is unusual in that he educates extensively without hammering you with the fact that he does offer paid training! As an extension of that free education he offers on his site, his training course/lead magnet takes you deeper into the nuances of Affiliate marketing. You’ll get a very good foundation without spending anything and you can be sure that it’s coming from someone who walks the talk. Charles, as much as anyone I know, helps you to think of Internet marketing as more than a set of skills, but as a business. Highly recommended. Brian Dean has become recognized as a true SEO guru. The proof is that he ranks very highly for some of the most competitive keywords imaginable: SEO-related keywords like onpage seo. 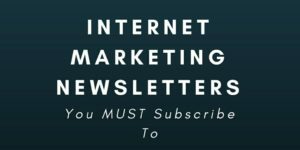 If you’re interested in Internet marketing his blog is an incredibly valuable resource, and there’s no reason not to get his newsletter either. Where to begin with Jeff Walker? He’s been using doing product launches and teaching others how to do them since the mid-1990s. Jeff delivers much–not all–of his education nowadays via video, taking advantage of his exceedingly likeable, easygoing manner. But don’t be fooled. He’s a true creative pioneer– the first time I heard the details of constructing a ‘Sideways Sales Letter’ I was blown away. Remember that I called each of these experts’ email sequences–the way they construct their emails, content mixed with sales–a source learning separate from their area of expertise? With Jeff Walker you also have an amazing lesson in ‘how to deliver value by being pleasant and natural on video’. Get signed up, because if you have an area of expertise (or even if you think you don’t!) Jeff will explain how to build a digital product around it, from A to Z.
Pete is a copywriter who focuses on helping people “launch simple yet highly profitable online courses”. He emphasizes education that won’t blow you out of the water if you’re worried you might not have enough tech skills to be effective. Take him up on it. Pete also uses Facebook heavily and along with joining his list you should join his Facebook group too. Bob is a master copywriter who’s published 100 books while sending out regular emails to his subscribers. His newsletters cover all aspects of making money from writing generally, but especially sales letters and copywriting. Sign up and you’ll get an ongoing education in how to balance ‘giving value’ in each email with a sales pitch in every email too. It can’t be easy to do this consistently, but I’ve been getting his newsletter for a long time and I’ve never been tempted to unsubscribe: too many interesting tips and educational topics. Dan teaches retargeting: using Facebook ads and Google Adwords to show ads for whatever you or your clients are selling online, after visitors leave your site and surf the web. The technology is extremely effective. In fact this is still one of the best marketing methods a person can learn, because it’s so effective and costs relatively little to run. Dan’s enthusiasm for retargeting is infectious and he excels at explaining it. He has a long career in sales behind him. It informs his approach and sets him apart as more of a business guy than most Internet marketers. Sign up and look at his quickstart video and you’ll see what I mean. When he shares his case studies I’ll bet you’re drawn right in. The first thing you’ll receive from Kurt is an incredibly helpful and well-written five-email sequence on making the transition from freelancing to offering productized services. Until you understand productized services you might think selling your time for money is the only way get paid for a marketable skill you have. Listen to Kurt’s story as a guy who went from selling one-off services at a low price to any client who would hire him, to offering a defined service to Shopify ecommerce store owners only. No exaggeration: it will really open your eyes, and maybe change your approach to your business. In fact if you’re a freelancer it should change your approach. Kurt is another one of those marketers I mentioned earlier, who shows you the kind of emails you should be sending to your subscribers long after they sign up, with pertinent, non-sales-y content that doesn’t turn people off. Who did I miss? What Internet marketing newsletters have blown you away even with their free content, whether you later bought a course from the people behind them or not? Let me know and I will expand this Digital Media Minute list over time. I bought Digital Media Minute back in late 2008 from a web developer. He’d had added content virtually every day–sometimes multiple posts per day–since he started the site in 2003. When I bought DMM it had over 3000 posts on it, almost all of which were indexed in Google. At the time the traffic was about 5,500 unique visits per day on weekdays, when most developers were at work and referring to the site for the answers to minor programming questions, or the sort of hacks that the former owner excelled at writing. Probably a majority of the posts were less than 100 words in length, as again the site functioned as a repository of thousands of one developer’s professional notes to himself. Some of the posts brought hundreds of visits each day, but Google loved even the less visited small ‘notes’– cumulatively they attracted a ton of long-tail traffic. Back then there was a place for a lot of sites like this, that aggregated answers like that, but it was not meant to last. In February 2011 the first Panda algo update hit Digital Media Minute badly, Panda 2.0 followed in April and things went from bad to worse. Penguin the following year didn’t hurt as much, but the traffic decline was pretty steady even outside of major algorithm updates. It was all an education for me. After not touching this site for years, for the last few weeks I’ve been adding content, almost daily. I’m just writing about a couple of my hobbies: tech generally and Internet marketing. I’m supporting myself online by the way, and have for years. Client work and my own projects. Not too difficult in Bali, Indonesia, where (the good) life is still inexpensive and where I’ve had a base for 12 years now. So yes–longer posts, just trying to be helpful or share genuine enthusiasm. Add an image with an alt tag, tweet out the URL to get it indexed a little faster, etc. Basic stuff. It hasn’t been hard for me to get a post together each day, share opinions and small tips of my own, no longer programming tips but more in line with topics with which I have experience, especially Internet marketing. But I’ve got a little plan. There is very little to lose when it comes to Digital Media Minute. Worse case, well, not much will change frankly, in terms of revenue the site is earning (enough each month for a half a pizza in the US of A, or a week’s worth of lunches at my favorite warung here in Bali) or traffic, under 100 visits per day as we are now. Best case, frankly any bump at all in traffic will be something of a victory as far as I’m concerned, and I’ll have some hard data I can share in an interesting case study. My plan has a few parts to it, and I’ll get more ideas as I go, as one does. This is a traffic generation challenge. Unlike in 2008, I won’t rely only on SEO to increase site traffic. But I still want to start by trying to increase traffic from search. In 2011, post Panda, I added content to the posts that were literally a sentence or two, so that every post on this site had 100 words, minimum. Took dozens of hours. Of course these posts were still insanely thin, but maybe just a little less laughably thin than they had been. Clearly it didn’t change anything. At the time I was considering radically culling the number of posts on the site, putting back to draft status all posts that had no backlinks, fewer than X amount of visits per month, and that had made zero or a few pennies income. I didn’t do it at the time because I thought there might be a chance that things would somehow improve over time. I no longer think that will happen. I think the thin pages are still hobbling the entire site, per my understanding of Panda. I’ve also been swayed by the example of people like Brian Dean of Backlinko, who was doing incredibly well in the SERPs even when he had fewer than 20 (epic) posts on his site, and adding new content only once a month or so (if memory serves). That is the opposite of what this site was built on, short posts and updates every day. Brian Dean is number 1 or 2 for ‘onpage SEO‘. Traffic to this site is down by 98%. In terms of strategy, I’m just not shooting for the super long tail traffic that used to be DMM’s bread and butter, as attracted by the short, specific posts I mentioned earlier. Fewer, longer posts are the way to go. But first I will cut the number of posts on the site radically. Over the course of the last year about 600 posts–out of 3000+ remember–received any traffic. In the last two years that number is under 1000. I’ll cut out any post that hasn’t been visited in the last 2 years. I’ll 301 any backlinks these posts have to them. Of the remaining 1000 posts, I’ll cut hundreds more. Only 600 posts have two or more visits in the last two years. 425 posts have 3 or more visits in the last two years. Only 338 have 4 or more. You get the idea. I can’t see how I’m hurting things if I end up with only a few hundred posts on Digital Media Minute, and maybe a lot less than that. I don’t expect to see a traffic explosion, of course! But we’ve heard anecdotes where doing this sort of thing can rather counter-intuitively increase traffic. I do think it’s worth an experiment. Especially since the posts I ‘cut’ will be simply put back to draft status, not deleted. After a few weeks–I’ll use one tactic at a time to see if it has any effect–I’ll put time into improving the remaining posts. I’ll select posts that rank at the bottom of page one or top of page two for their primary keywords, favoring primary KWs that have especially high search volume. Then, if we’ve seen any improvement at all, I’ll work on branding and a new theme, and list building. There’s a lot more to tell; I’ll elaborate further in an upcoming post. What I like is something that surprises me. If it goes against a generally accepted principal, something that gets repeated so often that we stop questioning it, even better. Robots taking jobs is a perfect example. In this article from Wired magazine by James Surowiecki (remember ‘Wisdom of Crowds‘?) explains why, while robots have started doing many jobs humans currently do (especially low-skilled jobs) there are plenty of other jobs that are being created in the larger economy. We usually think of the supposed impending robot takeover of jobs as a tech issue, but if we look at the **actual** economic data about some of the assumptions we seem to be collectively making, we get another picture entirely. I wanted to point Digital Media Minute readers at the article, despite the fact that it’s more about economics than tech, for exactly that reason. First, productivity–even in the manufacturing sector–hasn’t been rising as fast as it would be if the process of ‘robots taking all the jobs’ had really begun to any significant degree. Second, unemployment is very low historically, and wage growth is rising faster than inflation and productivity. Wouldn’t be happening if all the jobs were going to robots. Third, people moving from job to job (job churn) as robots supposedly take over just isn’t happening, and in fact is at a historic low. The article argues that the drop in US Manufacturing jobs in the last 20 or so years hasn’t been about automation anywhere near as much as it has been about Chinese manufacturing displacing US manufacturing. The article ends by pointing out that you can’t mourn the supposed ‘secular stagnation’ that our economy has been going through and be simultaneously afraid that the robots are taking all the jobs. If it happens as many people fear, the overall effect on the economy–a big rise in GDP, huge productivity gains, etc.–would be a huge positive, not negative. The full article is definitely worth a read. Back to our regularly schedule tech-obsessed content tomorrow! New WordPress plugins and themes are released constantly. As I was looking at different layout ideas for a new site I realized I was using a time-saving tool some people might not know about. To tell me quickly what WordPress theme and WordPress plugins a site is using I use Themestats. Even before you look at the source code you can look under the hood. I know there are lots of ways to do this but I’ve found this to be fast and painless for me. I’ve discovered plugins I didn’t even know about this way. If you’re like me you tend to have the same several plugins that you use as a baseline for all your sites. I get it, but I know there are a ton of other plugins that would be appropriate for some of my sites. But who has time to go exploring? This is a better way to discover new plugins because seeing functionality or a look that interests you is exactly the time when you should dig into whatever is creating that feature, a theme or plugin, and if it’s a plugin it could be a big help potentially over many of your sites and clients’ sites, from now on. Just as an example, I never knew till today that there is a WP plugin–Right Click Images Plugin–that disables the right mouse button clicks that would enable a user to easily save an image to his hard drive. Handy, and it took me seconds to dig in to find it. Usually it’s clear simply from the list of plugins that Themestats gives you which plugin is responsible for the feature you’re interested in. And though I’m more inclined to add a new plugin than buy a new theme, it’s good to discover nice new themes this way too. So I confess, I’ve been thinking about creating a viral website. OK I said it. I mean of course a site that depends on organic sharing of its content from readers on social media sites like Facebook, Pinterest, Instagram, Twitter, Reddit, etc., rather than focusing on SEO traffic or paid traffic. I can hear the eye-rolls among you: how can I even consider a viral site in September 2017? Am I not aware that for a several reasons the model is dying and that many sites which had lots of success a couple of years ago are really struggling now? I know the Facebook algorithm changed to favor content shared by users’ friends and family more than companies or people trying to make a buck. I know that viral sites are dropping like flies, or if they haven’t stopped posting entirely (a surprising number or formerly successful sites have) they have a small fraction of the visitors they once did. I know I need some kind of “pivot to video” strategy to take advantage of the way Facebook’s algo is favoring video nowadays. I even know that one exception (so far) to the nosedives viral sites are taking is LittleThings.com, which seems to still have some traction maybe because it prioritizes content creation rather than just ‘curation’ (i.e. ‘repurposing’ or rewriting content….). Knowing all this I remember something that happened around the turn of the century. And something that happened in the past couple of weeks. Exhibit 1: The “dot-com bubble” and bust was proclaimed by some–many?– at the time to be the logical end of irrational exuberance surrounding amazing technology. Tech was making implications it couldn’t possibly fulfill. Falling stock prices seemed to seal the deal, to some. But what happened? The best of those companies–even many that had huge drawdowns in their stock price, did not go out of business. Years later–Apple and Amazon are two incredible examples–they came back stronger than ever: both the companies and their stock prices. Exhibit 2: In the last couple of weeks Bitcoin and other cryptocurrencies have experienced gut-wrenching collapses in price for anyone holding them. I don’t know what will happen with all the cryptocurrencies that have sprung up in the last months, but I’m pretty sure of one thing. Regardless how their current values wash out in the next months and years, the technology–cryptocurrencies and Blockchain technology–will change the world. Just what we know we can do with them now is too compelling for both not to be a huge part of our future. I think that what we’ve seen with viral websites is the beginning of something bigger than any of us really understand, yet. I think it’s wrapped up with “fake news” and even Donald Trump getting elected. I think many factors have converged and we as a society are collectively creating new ways to tell our stories, to hear stories and be entertained too, to select what is important to us, and to make money in a new economic landscape. I think a small clue was the rapid outsized success of viral sites. I really do. A nerve was hit. Scott Delong, operating from a bedroom with a few contractors helping him, sells Viralnova for 100 million dollars. The word is “outsized”. The scale here was what was incredible, and Facebook changing their algo doesn’t mean these sort of rapid, scalable attractors of mass attention are done yet, in my opinion. Because virality itself is somehow just getting started, with or without the Facebook algo shoveling attention to these sites. If information wants to be free, attention wants to be possessed. That’s still true, potentially at viral scale, even if the viral site 1.0 model is broken. Virality is a force still waiting to be harnessed. The question is how to create a viable business model around Virality 2.0. Could Themed Newsletters Raise Your Email Open Rate? If your website has a subscriber list–I assume you have a list!–there are two potential problems you’ll always be trying to sidestep, and themed newsletters might help you do so. One is the challenge of keeping your content fresh and interesting enough to get your emails opened and hopefully engaged-with. The other is simply coming up with topics for these emails without pulling your hair out. Topical ‘pop-up’ themed newsletters can be a way to address both the challenges of content creation and engagement with your readers. 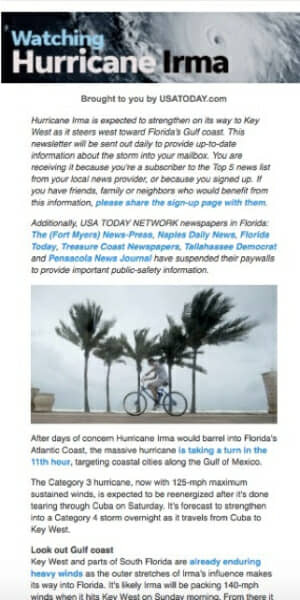 When Hurricane Irma came through Florida recently, USA Today used an interesting approach that turned out to be an unexpected win-win for both the newspapers and its readers. This weather event was about to affect just about every resident of Florida and much of the Caribbean. Why not use the reporting its network of local teams were generating to send out a curated daily summary to newsletter subscribers? They decided to try it, calling the temporary newsletter “Watching Hurricane Irma”. Since USA Today has no doubt deeply segmented its list of 10.5 million subscribers and sends out 500 different newsletters each month(! ), it wasn’t hard for them to focus on subscribers who’d be most interested in this particular series, i.e. mostly Florida residents. In this case, they saw an open rate of over 50%. 95% of respondents to a survey conducted afterwards responded positively. It’s interesting to me that most of those 500 newsletters I mentioned are currently are auto-generated. No doubt auto-generating a mix of already-written stories that should match the interests of given list segments is an easier way to organize and scale an effort like this, keeping costs low. Part of what USA Today learned here however was that it was worth it to allocate a staff writer to create an original newsletter, using stories and raw information the local reporters were gathering. As I said, this is as much a content generation strategy as it is a way to engage your readers. No one ever said you have to restrict the amount of broadcast emails you send out, or that you can’t send a one-off email sequence over a few days (or, periodically) that is definitely not evergreen. Why not focus on timely content that comments on or weaves in a current news story? As with website content, there’s a lot to be said for riding on the back of a topic that has built-in interest. Maybe there is an element of the story that would especially interest your subscribers, an angle that might not be covered by more general interest websites or news outlets? You probably wouldn’t want to use a themed newsletter related to a natural disaster like Hurricane Irma to monetize–I sure wouldn’t–but your own commentary on a current event could have possibilities for new monetization. Seems like testing themed newsletters might be worth a test. Google Search Results–What’s The Trick To Getting In? …..it seems that I must not have set my site up quite correctly, as my post is still not coming up in any Google search results. I’ve tried everything I can think of (alt text for pics, keywords in the edit snippet bit). It says ‘SEO – good’ in the Yoast plugin) and I have the green bullets! I’m lost. Anyway before I lose the will to live – is there any chance you can give me some advice on what I may have done wrong? Ok, here’s a little secret. If you have a question for me about tech, life, living in Bali (I’ve been in Bali for about 12 years, that’s true), or almost any other damn thing, if you’ll simply imply that your will to live is contingent on me getting you a good answer, you’ve probably found a way to compel me to answer. So now you know. I’m putty in your hands. Up to a point anyway. I have my pride, or some that remains. So here was my answer, outlining a powerhouse three-pronged approach, and I can only hope she gets into the search engine results pages (the “SERPs”) as fast as possible. And you do too, for that matter. First, enter the URL of your site into the search field at Google.com, e.g. www.digitalmediaminute.com. You should see your site, most likely as the first result. If it isn’t there then the site isn’t in the Google search results at all, i.e. Google’s index. There are several things we can do to get a site into the index, or as we say, get the site “indexed”. Here’s the first thing to check. You just want to make sure the noindex meta tag doesn’t exist in the homepage’s HTML code. Sound complicated? In WordPress it’s dead simple. If the box is checked, uncheck it click “Save Changes” and do the steps below. 2) Also easy, and good practice: post a link or multiple links to your homepage in Facebook, Twitter, LinkedIn, etc.. New pages on the web are discovered by crawlers coming from other pages and sites, via links. You can imagine that as important as social media is that crawlers are all over new posts on all the platforms. If they find your link they will follow it to your site and you’ll get indexed. Caveat: For a new site this will probably take days, even if you do everything I’ll suggest. It could take weeks. Don’t get discouraged and IMPORTANTLY–don’t let it stop you from creating content. Your site will get indexed and you’ll be getting free, targeted search traffic from the SERPs. We just cannot know how fast Google will index it. Also, you can certainly post links on social media to inner pages on your site. Do so. It is very good practice not just for SEO but to simply get the word out there about your content! 3) Signing up for Google Search Console ( https://www.google.com/webmasters/tools/ ) and verifying your site is also good practice if you’re serious about your site. Then, for new sites I submit a sitemap. You can either use a WordPress plugin to create your sitemap, or I think the Yoast SEO plugin (which I recommend in my “How to start a blog” post and video) will help you create it. 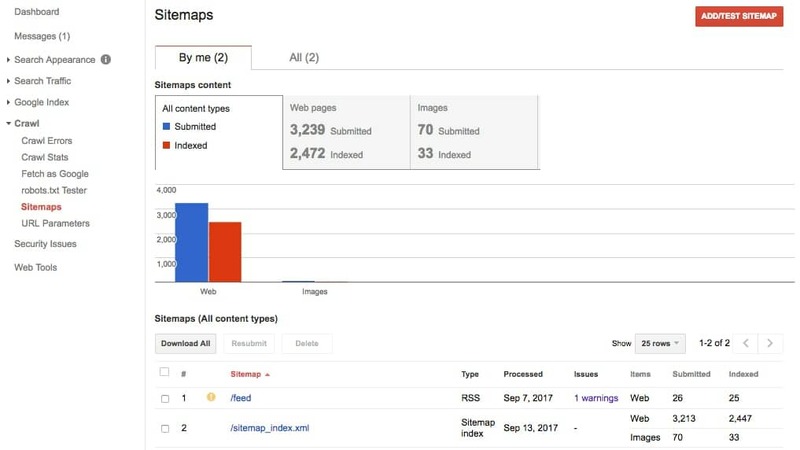 Here’s the section in Google Search Console where you submit your sitemap. See the red button in the upper right? After you submit your sitemap it can still take some time to have your site show up. Check using the method above; enter the URL into Google. As long as you have the box ticked in your WordPress settings as I show you above, the crawlers will find you eventually if you’ve submitted your site to Google, added it to Google Search Console, and submitted a sitemap. a) This might be obvious, but determining that your site is in fact in the SERPs **doesn’t mean** you will be ranking well for the keywords you’d like to show up for. That’s a different challenge, the SEO challenge. For conveying deep SEO knowledge via lucid explanations, I recommend learning from this guy. b) Making sure your homepage is in the Google search results is the first step, but you will want all the pages on your site to also be indexed in Google’s SERPs, naturally. Back to indexing inner pages of your site. We do not directly control how many of our pages are indexed. It’s Google’s index. But they do want to index your content. 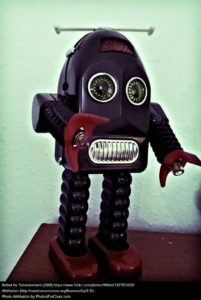 The most important thing is making sure your site is crawl-able by search engine robots. Don’t worry, a standard WordPress installation leaves you in good shape for crawlability and basic SEO…the idea is that once the homepage is indexed the crawlers will look for links on the page to go deeper into your site. This doesn’t mean you need to link to every post on your site from the home page(!). If you have several posts you will link to them all, in practice, but obviously with hundreds or thousands of posts this becomes impractical. Tags and categories help with all this but no need to overthink it in the beginning. So the point: having a link to your sitemap on the homepage, even if it is way down out of the way in the footer, is enough to give the crawlers access to everything, making it more likely that all the content you’ve worked to produce ends up in the Google search results. In closing I’ll say that just as sharing on social media helps your site’s initial indexing, it can only help to get your deep pages indexed too. Matt Diggity does a lot of things right. He’s become a well-known SEO figure on the strength of the quality of free lessons and tips he shares. Sign up for his list and you’ll see what I mean: no fewer than nine SEO resources come with your welcome email. Everything from an onsite SEO guide to the hosts he suggests for PBNs to scaling an SEO agency. Today I found an excellent post of his on how to get your or your client’s page into the featured snippet on page one of the SERPs. He definitely includes what I’d call non-obvious tips and ninja tactics. He also shows you what tool to use to do an audit of your pages so you can see where the low-hanging fruit is. If you don’t grab it on the first try, make some adjustments and try again. Don’t give up. Put it this way, I’ve never not been able to steal it. I’ve been meaning for a long time to test push notifications, as I’ve heard they have far better response rates than email, and the opt-in is so much faster. Finally I installed One Signal today on one of my sites and I’m sorry I didn’t do it sooner. I can’t speak yet for the the engagement I’ll get but man for a WordPress site creating a One Signal account, installing the plugin and setting up for Chrome, Firefox and Safari was a breeze. I know it’s capable of a lot more than I’ll probably need it for too. Incredibly to me, it is free, and there are no limits on devices, notifications, or integrations. Real time analytics, A/B testing and more right out of the box. I’m trying to stay objective but I’m not seeing a downside yet! I was pondering this preference Facebook is giving to video, especially live video, in terms of organic distribution. Engagement with video content is relatively high vs other types of posts so you’re rewarded for helping Facebook keep its users/your audience engaged. It’s no secret that YouTube also is favoring live video in the search algo. Two different newsletters to which I subscribe have been hammering their lists about a cute little hack for YouTube Live with Wirecast. Create placeholder video pages–a lot of them, it’s easy!–with titles and basic tags targeting long tail keywords for local SEO or affiliate products, then just put production dates in the future. If the page is ranking well enough when it’s indexed go ahead and upload your ‘live’ video using Wirecast at that time….I have my doubts abut the SERP rankings longevity of videos produced this way, but it’s an idea. Anyway, so it’s no surprise marketers are adapting and getting clever, and no doubt ways to make more money faster using video will surface. Same old story. Once we’re aware that the game has changed our only edge is to move as fast as possible. I was thinking that this situation feels somehow familiar to me, but I couldn’t put my finger on it. Since I don’t yet have a process in place to efficiently scale video production it feels a little uncomfortable to me too, I’ll admit it. Today I realized when I’d felt like this last. There had been times previous to these two algo updates in February 2011 (Panda) and April 2012 (Penguin) where seemingly everyone’s rankings fell off a cliff at the same time, but if you weren’t active in SEO at the time I can tell you, these were big. Oh the gnashing of teeth, people convincing each other that this was criminally unfair, that Google had taken the rankings to which they were entitled and flat-out given them to other people/pages! How dare Google call my unsound methods too unsound! The world kept spinning strangely enough, but still many SEOs were dismayed when we collectively looked at content that was still ranking and it became clear very quickly what wasn’t going to work from then on. That crap links, thin content, over-reliance on exact-match domain names and **many** other marginal methods might not be quite enough to rank you any more, or might actively hurt your rankings. That rather than making crappy sites that looked to Google like authority sites, maybe it was just going to be easier to make authority sites! Ironically the methods you were going to have to change was mostly the stuff you didn’t feel great about doing in the first place. It took no more than a few days for people to see that to succeed at SEO going forward, quality content would be more important than ever. But back to my point. Let’s look at the way things have happened in the last few years with Facebook. First Facebook decides long ago, as a response to engagement slipping by some amount and users getting overloaded with commercial content, that organic reach would be tweaked so that you’d see more content from friends and family. This meant if your business or client wanted to reach the huge swath of people you’d formerly reached that you’d have to buy the attention, God forbid. Now another change is upon us as relative to video usage patterns. Facebook is rewarding those who make videos part of their strategy more aggressively. If, like me, you still feel behind the curve as far as video, or even a live video strategy goes, you might find your inner toddler protesting against the new lay of the land: I am text-oriented, and how dare Facebook make it a condition of gaining an advantage in the algo to use video more aggressively. How dare they! And Google with their YouTube Live! The point is that we have similar challenge today in trying to get favorable placement both in Facebook and in the Google SERPs against the way the SEO game changed many times in the past. Just because we won’t wake up tomorrow and behold the drama of disappearing pages from the SERPs doesn’t mean the threat isn’t there in the next year or two. It is. Evolve or flip burgers. Find a way to leverage video (ideally live video) for you or your clients, or get seriously hobbled. How? If you’re doing lead-gen or affiliate stuff, how will you get your content and offers visibility at scale if the task can no longer be accomplished as easily (or in the same way) as we formerly outsourced a ton of written articles? How do you help a client leverage live video if they certainly won’t take to it with the enthusiasm of a 16 yr-old on Snapchat? I’ve got some ideas and I’ll bet you do too. Go make some mistakes, find a seam, conjure up a process and get that SOP created.